OutSystems technology combines the productivity offered by visual modeling tools with the level of extensibility found in integration suites and custom development frameworks. The OutSystems Platform gives you everything you need to rapidly create and deploy enterprise applications and then change those applications at any stage of their life cycle. At the core of our value proposition you will find a highly intuitive visual environment and a breakthrough deployment technology that is helping businesses deliver business applications and services in weeks, instead of months or years. OutSystems Service Studio, a visual IDE, makes it easy to create web pages, business logic and data entities with just a few clicks. Getting your applications live is one click away. No deployment procedures required! You can manage several applications, services and integration components from a single web-based console. The OutSystems Community is open and growing. Meet other users and access our forums, online help, samples, and tutorials. 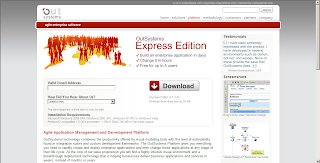 OutSystems Express Edition is free for commercial and personal use up to 5 applications users. Also, your database must be on the same server as your applications and you must have a single application server (no clustering). OutSystems Express Edition is best suited for individual use, small IT departments or departmental IT teams. If you want to know more about other editions of the OutSystems Platform, please see the OutSystems Platform Editions feature list.